This Award recognises and encourages the achievement of a student, staff member, or alumni who have made an exceptional contribution toward the College's community engagement objectives. The Council congratulates the inaugural joint-winners of the 2018 Alphacrucis College Community Engagement Award, Dr Kevin Hovey and Pastor Glenys Hovey. 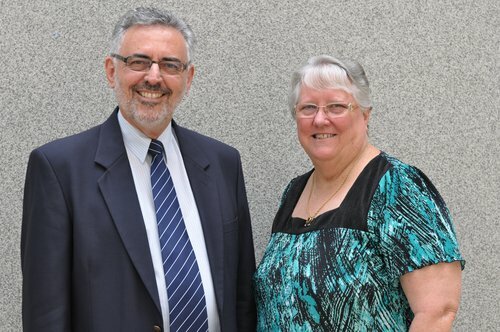 Kevin and Glenys have been awarded for their leadership and for their many years of service to missions, the church, education and to their local community. Kevin and Glenys work tirelessly together in whatever vocation or community God has placed them. Kevin has worked in missions since travelling to Papua New Guinea (PNG) in 1968, with Glenys following him soon after. Together they served the people of PNG for over thirty years. Kevin held senior leadership positions in missions, including being appointed as the World Missions Director of Assemblies of God in Australia. In honour of his service to the PNG community and church, Kevin was awarded the Member of the Order of Logohu at the 2017 Independence Day Honours in Port Moresby, PNG. Kevin has been involved with his local community in Chester Hill and Parramatta, NSW, Including serving on and chairinghis local residents associations. Kevin is currently AC's Head of Department for Pastoral and Cross Cultural Ministry. Glenys has collated resources to preserve the history and impact of missions, particularly in PNG. She has maintained a strong mentorship role and connection with missionaries and pre-service ministers. Glenys also serves on the inaugural AC Bequest Society Committee and is active in AC alumni. Glenys currently lectures in Missiology at AC. The impact of the Hoveys on the various communities they served is palpable. At an age when most people have already entered retirement, the Hoveys are still seeking ways to better serve God and their community.